The vaccine contract manufacturing market currently accounts for less than 1 percent of the total vaccine market — approximately $705M of $33.7B — but it is expected to grow over the next decade. Varying factors will influence the growth of the contract manufacturing market segment, including overall growth of the vaccine market, especially in emerging markets, as well as the shift in the dynamic of outsourcing relationships. Traditionally, vaccines had been viewed as a low-margin business with high barriers to entry. Complexity of development and production, combined with significant fixed costs, low profit margins, and overregulation had limited competition among vaccine manufacturers and supposedly restricted innovation. However, advances in both preventative and therapeutic vaccines have renewed interest and brought about competition in this market segment. Among Nice Insight survey respondents, the primary area of therapeutic focus for vaccine production outsourcers is infectious diseases, at 71 percent. Increased global demand for the influenza vaccine has contributed significantly to the growth of the outsourced vaccine market — especially since the vaccine doesn’t offer long-term immunity and must be administered annually. Support and media exposure from organizations such as the International AIDS Vaccine Initiative help to keep the important role of vaccines in healthcare in the forefront and drive attention toward developing vaccines for diseases that currently have no cure. This exposure, coupled with recent reports of progress in two separate approaches to provoking an immune response to HIV, certainly contribute to the increasing number of biopharmaceutical companies interested in developing or manufacturing vaccines. Advances in both preventative and therapeutic vaccines have renewed interest and brought about competition in this market segment. Oncology is another key area for vaccine advances, with 52 percent of vaccine outsourcers engaged in this therapeutic category. Nationwide immunization programs for HPV (human papillomavirus) vaccination established in 2008 in the U.S. and Europe have strengthened this market to an estimated value of $2.2B by 2018. The efficacy of the vaccine, as well as the expansion of the target audience to include both males and females, has secured the HPV vaccine’s future and made it a strong candidate for outsourced production. 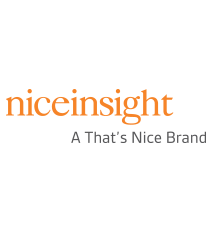 Anticipated shifts in vaccine production from innovators to contract manufacturers influenced the decision to add this service to the Nice Insight Biopharmaceutical Outsourcing Survey for 2014. At present, the data show 13 percent of all respondents will outsource vaccine production, or 40 percent of respondents who outsource biomanufacturing. Big Pharma and Big Biotech account for the majority of vaccine outsourcing, comprising 59 percent of the buying market. Emerging biotech and emerging pharma each comprise approximately 15 percent of the buying market, and specialty pharma accounts for the remaining 10 percent. 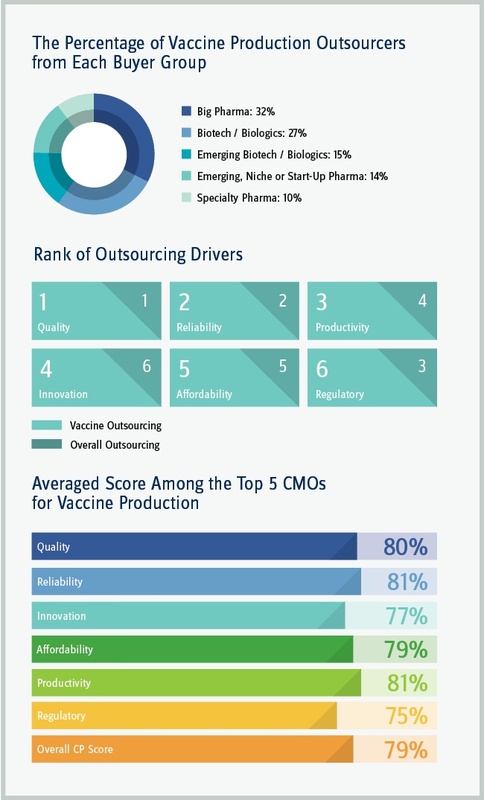 While quality and reliability consistently hold the top two positions among partner attributes, when it comes to selecting an outsourcing partner for vaccine production, the importance of productivity and innovation move upwards, causing a company’s regulatory track record to shift to sixth position. In fact, when reviewing the companies most likely to be considered for an outsourced vaccine project, the top five companies scored best in quality, reliability, and productivity. This ranking makes sense, as reliability is directly linked to security in supply, and productivity is directly linked to time-to-market. Security in supply is particularly important for routine vaccines, whether they are childhood immunizations or, like the newer HPV vaccine, administered during adolescence. Time-to-market becomes a considerable issue when there is a surge in the need for a vaccine, such as the flu vaccine when a particularly bad strain hits or during times like the swine flu and bird flu outbreaks. As CMOs continue to be viewed as trusted partners in bringing drugs to market, their expansion into segments such as vaccine production will continue to add value to drug innovators in terms of product security, improved time-to-market, and increased capacity — all traits where the positive impact is passed on to the health of the consumer.